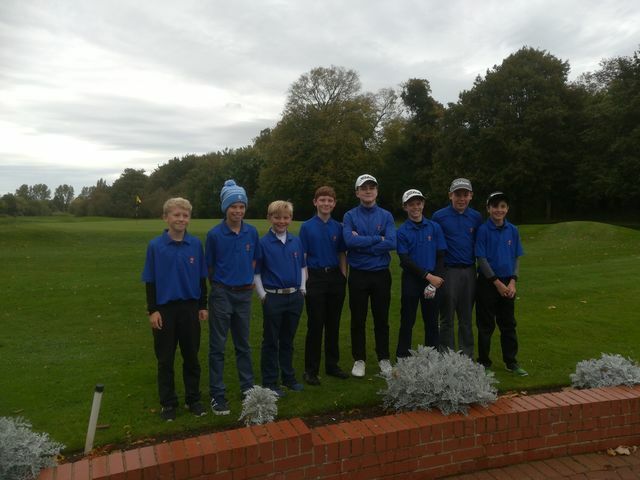 Northants Under-14 Boys overcame a strong Leicestershire team in today’s friendly fixture held at Peterborough Golf Club by the narrow margin of 11-9 holes. This was a close match decided by some stunning play on the 18th hole by Northants Juniors. The format was 18 holes betterball Pairs matchplay (90% handicap difference off lowest handicap player) with all holes to count. The lead match was comfortably won by the Leics pair Sam Haynes-Coote and Sam Envis who played some superb golf. Although all square at 9, the two Sams played superbly on the back 9 to win 5 up against Adam O’Brien and Jack Peters. In the second match Northants pair Jacob Williams and Elliot Strickland were trailing 6 down but won two of the closing holes to bring the score back to 4 down. Jacob’s brilliant birdie on the 18th was to prove absolutely crucial to the overall aggregate score. The third match provided a much-needed boost for Northants with another tap-in birdie on the 18th hole for Kai Raymond, who with Harry Smith, had played excellent golf to grind out victory and go 4 up on that final hole. Behind, in the final group, Morgan Cresswell -on his debut for Northants- produced a series of winning shots and together with Oscar Bell, another newcomer to County Golf, the pair steadily piled on the pressure against two very good opponents until they led 7 up going up 18. A half on the final hole meant Northants had snatched the overall win with this fourth match by just two holes. The result could have easily gone the other way and the teams were very closely matched, with probably Peterborough Milton Juniors using their local knowledge to full advantage. The match was thoroughly enjoyed by the Leicestershire contingent who may well reciprocate next year by offering a return friendly fixture. Thanks to all who supported this event, parents, organisers, coaches, and officials. Team Photo and Results sheet attached (l to r: Oscar Bell, Jack Peters, Elliot Strickland, Kai Raymond, Adam O’Brien, Harry Smith, Jacob Williams, Morgan Cresswell.